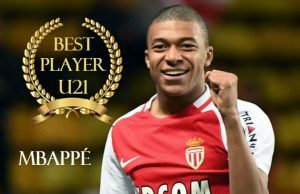 Kylian Mbappe is among the ten nominees set to take the first Kopa Trophy, in the best U21 category, home. The young player, currently aged 19, is a heavy favorite for the award, given his exemplary performance at the World Cup in 2018. Also among his achievements are 21 goals he scored for PSG in their domestic matches. Mbappe began his career at an early age, having started at a youth academy in Bondy before moving on to Monaco. Here, he made his debut in professional football at sixteen and enabled the team to make away with the Ligue 1 title for the first time in seventeen years. From here, Mbappe moved to PSG after a one hundred and eighty million Euros transfer. This amount not only made him the most expensive teenager of his time but it also made him the world’s second most valuable player. He made a lot of achievements in his career as he played alongside his teammates in the domestic treble. He is also the second teenager to score in a World Cup Final, which has further added significant points to his career. As such, many people expect that he will walk away as the best player U21, as he did with the Best Young Player Award following the World Cup.